The name plate provides lines to write student names and/or numbers. 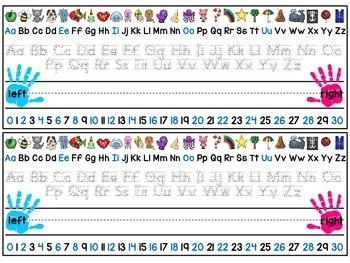 At the top is the alphabet (uppercase and lowercase) with pictures for student reference and proper letter formation. Consonants are black and vowels are blue. At the bottom are numbers 0-30, even numbers are blue and odd numbers are black. Print on white cardstock for durability and laminate before use.